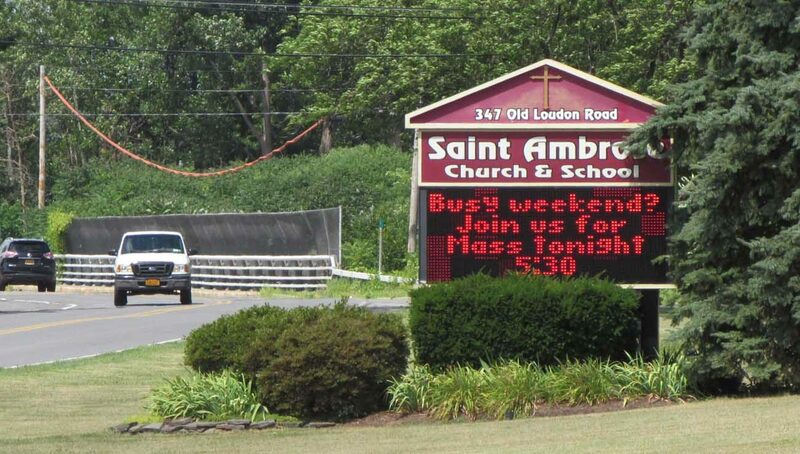 ALBANY, N.Y. (CNS) — Going to church on Sunday morning is a tradition for most Catholics, but a new trend may be emerging: Sunday-evening Masses. St. Michael the Archangel in South Glens Falls is one of nearly a dozen parishes in the Diocese of Albany that offer a Sunday-night Mass. It’s the only parish in that area with an evening Mass on Sundays. Five years ago, Father Guy A. Childs, pastor, started offering a 5:30 p.m. Mass on Sundays at St. Michael twice a month. It quickly became popular. In 2015, it became a weekly offering. “It really does fit a need,” the pastor explained in an interview with The Evangelist, Albany’s diocesan newspaper. According to a census of Massgoers across the diocese conducted every October, 71 parishioners attended St. Michael’s 5:30 p.m. Mass in 2016 on the weekend surveyed. When the October Mass count was repeated in 2017, 134 parishioners attended the Mass — around a 30-percent increase from the previous year. Father Childs said the evening Mass is beneficial for families who want a chance to sleep in on Sunday or have weekend obligations that may keep them from attending morning Mass. The evening Mass gives parishioners a “last chance to get to Mass on Sunday,” he said. JeanAnn Dennis, a parishioner at St. Michael, attends the evening Mass there because it fits into her schedule. Some weekends, she doesn’t have time to get to the 4 p.m. Saturday vigil Mass, and she watches her grandchildren all day on Sundays. St. Vincent’s Sunday-evening Mass is offered only during the academic year to accommodate students from The College of Saint Rose, located very close to the parish. But all Sunday-evening Masses are working with the same mindset: to accommodate a specific group of night-owl worshippers. Anna Hartz, a parishioner at St. Madeleine Sophie, believes that evening Masses “have become more convenient” over the years. Hartz attends her parish’s 7 p.m. Mass on Sundays. She started going when her daughter became an altar server for that Mass, but now says she enjoys the night Mass more. Moreover, the popularity of certain Mass times can be tied to specific cultures and areas of the world. A native of England, Father Barratt noted that “many parishes have more Sunday evening Masses” there than in the United States. His home parish in the U.K. offered two Sunday-evening Masses. In the Albany Diocese, Father Barratt said a parish wishing to add an additional Sunday-evening Mass would have to ensure that it was sustainable. The season, the weather and a variety of other factors can lower the attendance at an evening Mass. Father Belogi said the same: His Sunday-evening Mass “attracts people from a variety of parishes. Weekend obligations or sleep in on Sunday … So it is more important to go to Walmart or sleep in that go to Mass! My grandmother always taught me that as soon as you open your eyes on Sunday Everything else stops until you get to Mass! Now like everything else in the Church, God comes after everything else. Is it any wonder that only about 25% of Catholics go to Mass any how! The powers to be are destroying the Church from within. I attended 7 PM Mass at St. Eleanor, Collegeville, last night which was well attended (and the choir was amazing). Earlier I had a bad headache, but later felt better and was grateful that a nearby parish had a late Mass, as my parish does not.